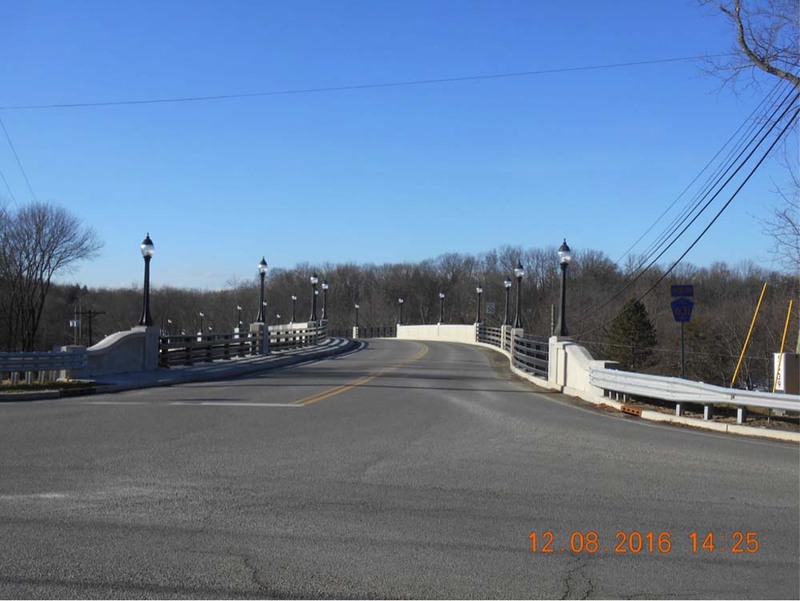 Meriden Road Bridge over Beaver Brook provides for two 13’ lanes of traffic with no shoulders and no sidewalks. The railing does not meet crash tested requirements. It is expected that the new structure will provide two lanes with small shoulders, based on traffic volumes, and suitable crashworthy railings. The following is a picture of a similar replacement structure we completed this year in a nearby county. 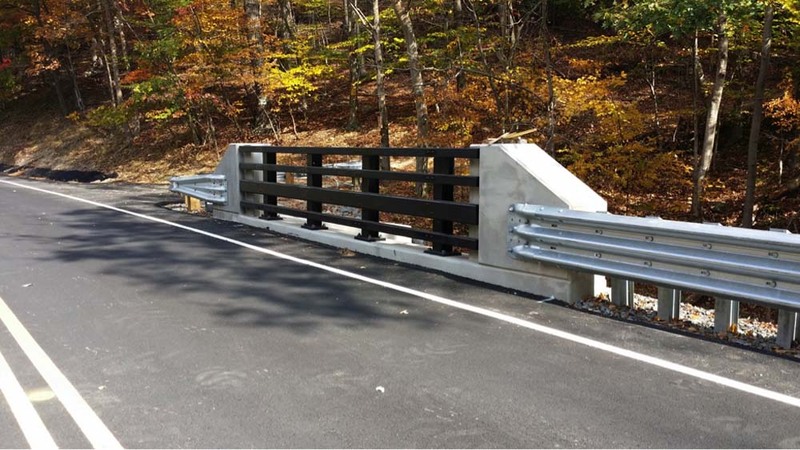 We will study alternate bridge structure types including a conventional steel or prestressed beam and deck slab on concrete abutments and various precast concrete rigid frame or arch structures. NJDEP regulations do not permit a box culvert structure with its concrete floor slab but rather seeks a 3-sided rigid frame structure with a natural material streambed. It is expected that a precast structure will be the most economical choice and will also lend itself to fast construction mitigating the traffic impacts to the public. A conventional concrete abutment and steel or prestressed beam superstructure are probably more costly to construct for a structure of this small size opening and span of only 17 feet. The estimated culvert structure construction cost would be in the range of $180,000. We will obtain 2 soil borings for the structural design. Rock is expected to be rather shallow based on all the rock outcrops seen around the site. We would ask the county to assist with a detour or else the driller will utilize a company to provide flagging for alternating traffic. The borings are expected to take one day. We do not expect any extraordinary measures needed for scour protection and footing support. Due to the light loads that result from a precast culvert design, we expect that a pile foundation will not be required and no additional fee is needed for engineering. Russia Road Bridge over Russia Brook is one span and currently provides for two 13’ lanes of traffic with no shoulders and no sidewalks. The existing railing does not meet crash-tested requirements. The existing prestressed concrete beams were constructed on existing abutments which are scour critical. The plastic barriers on one side of the road implies that the beam below is in poor condition and traffic is being kept away from imposing load to it. As such, the structure needs complete replacement. It is expected that the new structure will provide two lanes with adequate shoulders, based on traffic volumes, and suitable crashworthy railings. The bridge footprint will be set to meet permit-by-rule regulations. 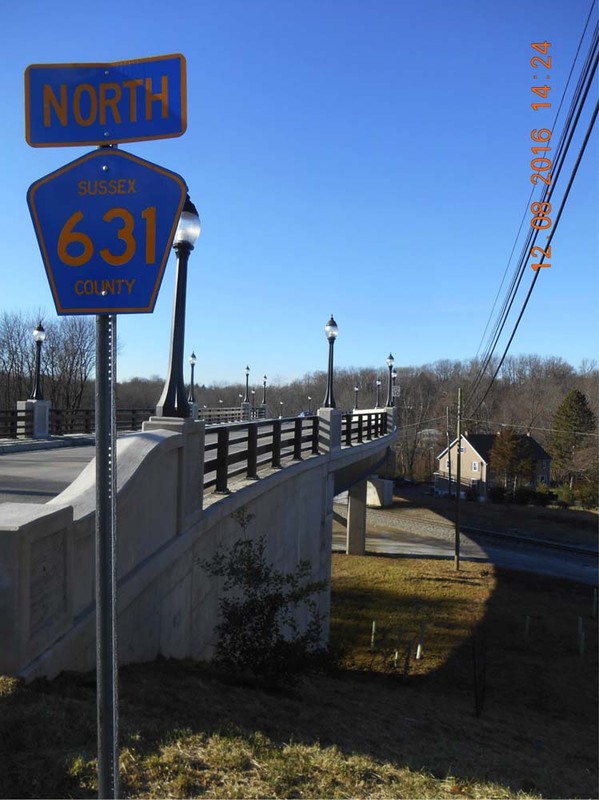 We will study alternate bridge structure types for the existing 60’ span bridge including a conventional steel or prestressed beam and deck slab on concrete abutments. Superstructure depth will be a driving criterion to satisfy hydraulic regulations. A steel stringer and deck usually costs a little more than a prestressed concrete superstructure but provides a longer useful life. We will optimize the beam and slab depth to satisfy this regulation and give cost comparisons for county consideration. It is noted that the existing beam and brush curb depth is likely enough to allow for a stringer superstructure to be a viable option. The estimated structure construction cost would be in the range of $900,000. We will obtain 2 soil borings for the structural design, one at each abutment. Since the structure is identified as scour critical, rock is not expected to be too shallow. We would ask the county to assist with a detour or else the driller will utilize a company to provide flagging for alternating traffic. The borings are expected to take two days. We expect to use steel sheeting for scour protection and footing support. The sheeting will be tied to the footing and eliminate the need for pile support. We expect that a pile foundation will not be required and no additional fee is needed for engineering. The following photos are of recent prestressed concrete and steel stringer bridges we did in a nearby county. West Central Avenue Bridge over a Tributary to Rockaway River provides for two lanes of traffic with no striped shoulders and one sidewalk. The ornamental railing does not meet crash-tested requirements. It is expected that the new structure will provide two lanes with small shoulders, based on traffic volumes, and a suitable crashworthy railing or parapet. We will study alternate bridge structure types including a replacement steel beam and deck slab on the existing concrete abutments and various precast concrete rigid frame or arch structures. 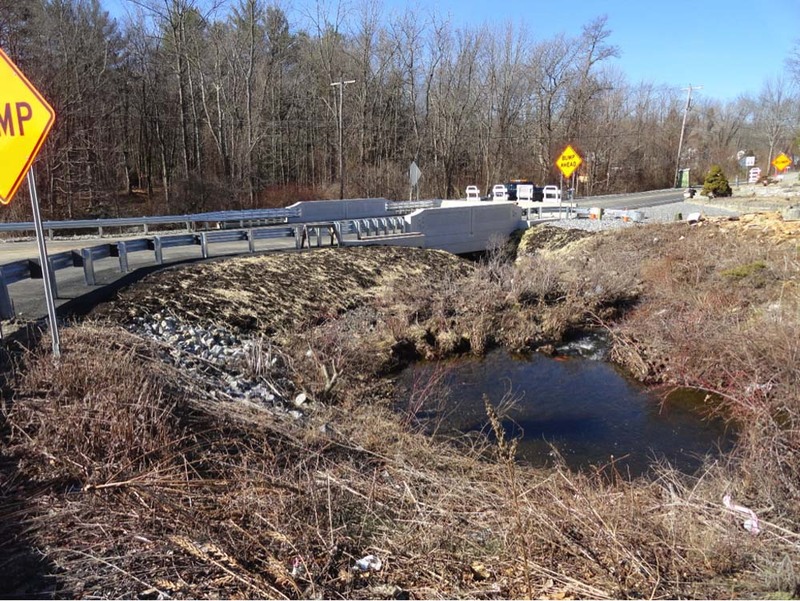 NJDEP regulations do not permit a box culvert structure with its concrete floor slab but rather seeks a 3-sided rigid frame structure with a natural material streambed. It is expected that a precast structure will be the most economical choice and will also lend itself to fast construction mitigating the traffic impacts to the public. A conventional concrete abutment and steel beam superstructure are probably more costly to construct for a structure of this small size opening and span of only 8 feet. The estimated culvert structure construction cost would be in the range of $125,000. We will obtain 2 soil borings for the structural design. We would ask the county to assist with a detour or else the driller will utilize a company to provide flagging for alternating traffic. The borings are expected to take one day. We do not expect any extraordinary measures needed for scour protection and footing support of a small span structure. Due to the light loads that result from a precast culvert design, we expect that a pile foundation will not be required and no additional fee is needed for engineering. The following photo is of a short span culvert we recently did in a nearby county.